Mouse anti Alix antibody, clone 3A9 used for the evaluation of ALIX expression in tumors by western blotting. Lipid analysis of mesothelin. (A) Tandem mass spectrometry (ESI_MS2) of choline-containing phospholipids, phosphatidylcholine (PC) and sphingomyelin (SM). Lipids were extracted by the chloroform/methanol solvent Folch mixture from their association with the immunoprecipitated mesothelin from OVCAR3 cell culture supernatant. The high proportion of SM relatively to PC in the supernatant is revealed by the amplitude of peak m/z 703 (palmityl-SM) compared with peaks at m/z 732 (32:1 PC), 760 (34:1 PC) and 786 (36:2 PC). Parent phospholipids of the phosphorylcholine ion (+184) are indicated as (total carbon number in acyl chains:double-bond number PC). Cholesterol assay by MS2 is obtained after acetylation of the non esterified sterol by recording of the transition 446 (acetyl-cholesterol + NH+4) to 369 (not shown). SM/cholesterol molar ratios are given as mole/mole after calibration. (B) Western Blot analysis of immunoprecipitated mesothelin from tumor conditioned media (right lane) and tumor cell lysates (left lane) as positive control. Membranes were probed with anti-Mesothelin, -TSG101, - Alix, or β actin, as indicated. Signals were detected by ECL. From: Dangaj D, Abbott KL, Mookerjee A, Zhao A, Kirby PS, Sandaltzopoulos R, et al. (2011) Mannose Receptor (MR) Engagement by Mesothelin GPI Anchor Polarizes Tumor-Associated Macrophages and Is Blocked by Anti-MR Human Recombinant Antibody. Mouse anti Alix antibody, clone 3A9 used to evaluate Alix expression in HEK293 cells by immunoprecipitation and western blotting. ALG-2 interaction with ALIX relieves the intramolecular interaction of ALIX. (a) Cytosolic proteins from HEK293 cells were mixed with GST or GST-ALG-2 and immunoprecipitated with mouse IgG or indicated monoclonal anti-ALIX antibodies. Input proteins and immunocomplexes were immunoblotted with indicated antibodies to visualize ALIX, IgG, GST, and GST-ALG-2. (b) Identical amounts of cytosolic proteins from HEK293 cells were mock treated (control) or mixed with CaCl2, CaCl2 plus GST-ALG-2 (CaCl2+ALG-2), or EGTA plus GST-ALG-2 (EGTA+ALG-2), and same aliquots from each sample were immunoprecipitated with each of the three indicated monoclonal anti-ALIX antibodies. Input proteins and immunocomplexes were immunoblotted to visualize ALIX and IgG. (c, d) Cytosolic proteins prepared from HEK293 cells ectopically expressing FLAG-CHMP4B (c) or FLAG-TSG101 (d) were mixed with CaCl2 or CaCl2 plus GST-ALG-2, and samples were immunoprecipitated with a monoclonal anti-FLAG antibody. Input proteins and immunocomplexes were immunoblotted with indicated antibodies to visualize ALIX, GST, GST-ALG-2, and FLAG-CHMP4B (c) or FLAG-TSG101 (d). (e) Cytosolic proteins prepared from HEK293 cells ectopically co-expressing FLAG-TSG101 and WT GFP-ALIX or FLAG-TSG101 and ΔTDS GFP-ALIX were immunoprecipitated with polyclonal anti-FLAG antibodies in the presence or absence of supplemented GST-ALG-2 and CaCl2. Input proteins and immunocomplexes were immunoblotted with indicated antibodies to visualize GFP-ALIX, FLAG-TSG101, GST, and GST-ALG-2. (f) Cytosolic proteins prepared from HEK293 cells with or without expression of FLAG-TSG101 were first incubated with GST-ALG-2 plus CaCl2 for 30 min (step A), and then incubated for another 30 min in the presence or absence of added EGTA (step B). After samples were immunoprecipitated with the 1A3 antibody, input proteins and immunocomplexes were immunoblotted with indicated antibodies to visualize ALIX, GST-ALG-2, and FLAG-TSG101. 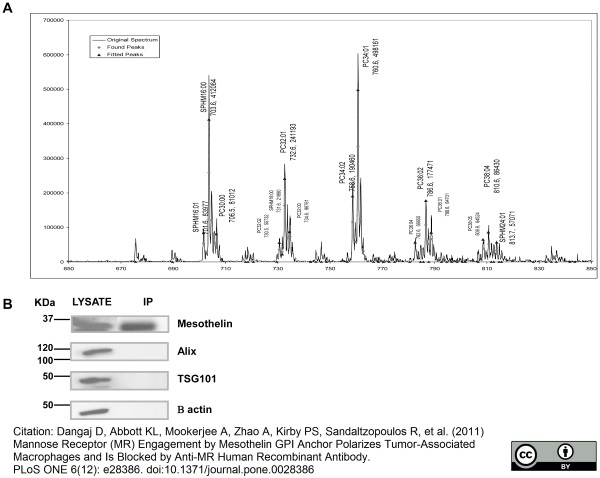 (g, h) Cytosolic proteins prepared from HEK293 cells were mixed with GST or GST-p6 in g and GST or GST-p9 in h. Samples were then processed as described in f, except that input proteins and immunocomplexes were immunoblotted with indicated antibodies to visualize ALIX, GST-ALG-2, or GST/GST-p6 (g) or GST/GST-p9 (h). (I) A schematic illustration of ALG-2-induced relief of the intramolecular interaction of ALIX and the role of partner protein binding in maintenance of the open conformation of ALIX after ALG-2 dissociation. 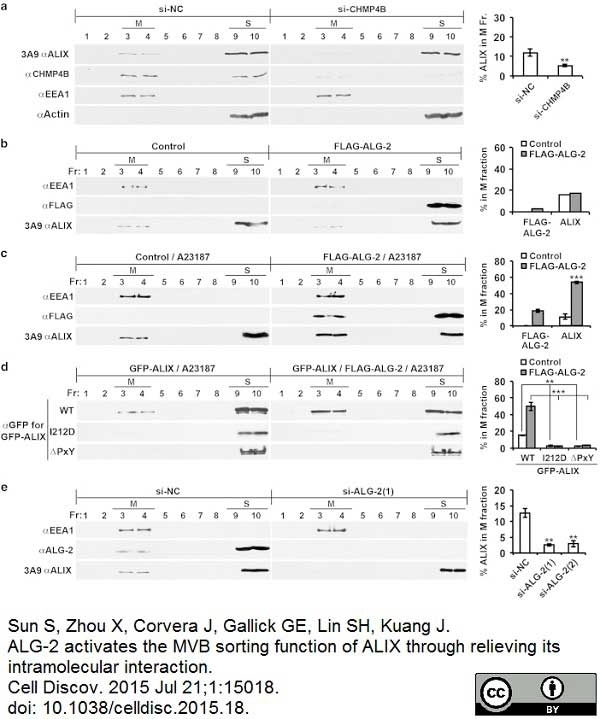 ALG-2, apoptosis-linked gene-2 product; GST, glutathione S-transferase; IgG, immunoglobulin G.
From: Sun S, Zhou X, Corvera J, Gallick GE, Lin SH, Kuang J.
ALG-2 activates the MVB sorting function of ALIX through relieving its intramolecular interaction. Cell Discov. 2015 Jul 21;1:15018. 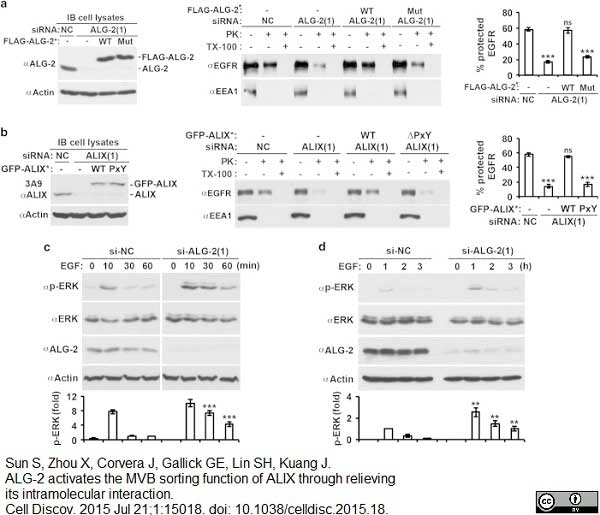 Increased ALG-2 interaction with ALIX is responsible for increased ALIX association with the membrane in EGF-stimulated cells. (a) HEK293 cells were mock treated or stimulated with EGF for 1 h and processed as described in Figure 2a (left panel). The average percentages of ALIX, ALG-2, and CHMP4B in the M fraction and s.d. were determined from three independent experiments and plotted (right panel). (b) HEK293 cells were processed as described for a, except that cells were treated with BAPTA-AM starting 1 h before EGF stimulation (left panel). The average percentages of ALIX in the M fraction and s.d. were determined from three independent experiments and plotted (right panel). (c) Serum-starved HEK293 cells transfected with indicated siRNAs were mock treated or stimulated with EGF for 1 h and processed as described in Figure 2a. The average percentages of ALIX and ALG-2 in the M fraction were determined from two independent experiments, and error bars indicate the range of the results (right panel). (d) Serum-starved HEK293 cells transfected with an empty vector (control) or a FLAG-ALG-2 expression vector were stimulated with EGF for 1 h and processed as described in Figure 2a. The percentages of ALIX in the M fraction were determined from two independent experiments, and error bars indicate the range of the results (right panel). (e) HEK293 cells ectopically expressing indicated forms of GFP-ALIX were mock treated or stimulated with EGF for 1 h and then processed as described in Figure 2a (left panel). The percentages of GFP-ALIX in the M fraction and s.d. were determined from three independent experiments and plotted (right panel). ALG-2, apoptosis-linked gene-2 product; EGF, epidermal growth factor; GFP, green fluorescent protein; M, membrane fraction; NS, not significant; siRNA, small interfering RNA. ALG-2-unlocked ALIX quantitatively associates with the membrane. (a) An experimental flowchart for determination of the distribution of ALG-2-unlocked ALIX between the M and S fractions by immunoprecipitation. 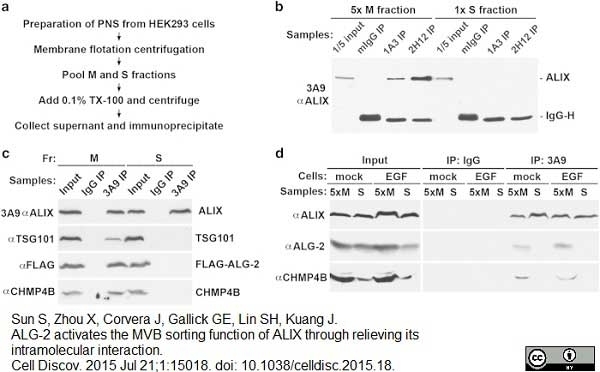 (b) After HEK293 cells were processed as described in a, 5:1 volumes of aliquots taken from the pooled M and S fractions were immunoprecipitated with mouse IgG or indicated anti-ALIX antibodies. Immunoprecipitation input and immunocomplexes were immunoblotted with the 3A9 antibody to visualize ALIX and IgG. (c) HEK293 cells were transfected with FLAG-ALG-2 and treated with A23187 for 15 min. Cells were processed as described in a, and equal volumes of aliquots taken from the pooled M fraction and S fractions were immunoprecipitated with the 3A9 antibody. Immunoprecipitation input and immunocomplexes were immunoblotted with indicated antibodies to visualize ALIX, FLAG-ALG-2, TSG101, and CHMP4B. (d) Serum-starved HEK293 cells were mock treated or stimulated with EGF for 1 h, and both serum-starved cells and EGF-stimulated cells were processed as described in a. From the pooled M and S fractions, 5:1 volumes of aliquots were taken and immunoprecipitated with mouse IgG or the 3A9 anti-ALIX antibody. Immunoprecipitation inputs and immunocomplexes were immunoblotted with indicated antibodies to visualize ALIX, ALG-2, and CHMP4B. ALG-2, apoptosis-linked gene-2 product; EGF, epidermal growth factor; IgG, immunoglobulin G; M, membrane fraction; PNS, post-nuclear supernatant; S, soluble fraction. Mouse anti Alix antibody, clone 3A9 used to evaluate Alix expression in HEK293 cells by western blotting. 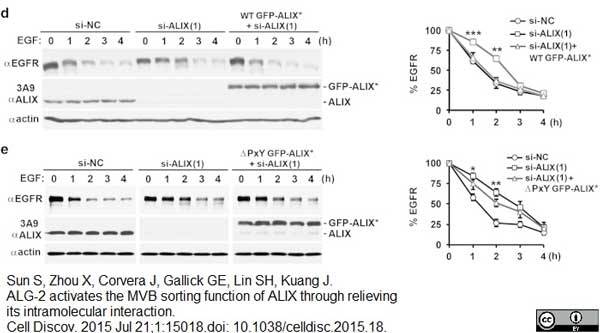 Activation of ALIX by ALG-2 has a rate-limiting role in MVB sorting of activated EGFR. (a) HEK293 cells were first transfected with si-NC or si-ALG-2(1) and cultured for 48 h. These cells were then transfected with the expression plasmids for WT FLAG-ALG-2* or Mut FLAG-ALG-2* (E47A/E114A mutation in ALG-2) and cultured for another 12 h. After serum starvation for 12 h, these cells were stimulated with EGF for 30 min and assayed for MVB sorting of activated EGFR by the proteinase K protection assay (left and middle panels). The average percentages of protected EGFR and s.d. were determined from three independent experiments and plotted (right panel). (b) HEK293 cells were transfected with indicated siRNAs and expression plasmids for GFP-ALIX* and processed as described in a. (c, d) HEK293 cells transfected with indicated siRNAs were stimulated with EGF for the indicated minutes (c) or hours (d), and cell lysates were immunoblotted with indicated antibodies to visualize phosphorylated ERK1/2 (p-ERK1/2), ERK1/2, and actin (top panel). The relative levels of p-ERK at different time points were determined, normalized against the level at 60 min in c and 1 h in d. The average levels of p-ERK and s.d. were determined from three independent experiments and plotted (bottom panel). ALG-2, apoptosis-linked gene-2 product; EGFR, epidermal growth factor receptor; GFP, green fluorescent protein; MVB, multivesicular body; NS, not significant; si-NC, negative-control small interfering RNA; siRNA, small interfering RNA. Inhibition of activation of ALIX retards degradation of activated EGFR. (d, e) HEK293 cells were transfected with si-NC or si-ALIX(1) and cultured for 48 h. These cells were then transfected with plasmids for WT GFP-ALIX* (d) or ΔPxY GFP-ALIX* (e) and analyzed for EGF-induced EGFR degradation as described in a, except that immunoblotting with an anti-ALG-2 antibody was changed to immunoblotting with the 3A9 anti-ALIX antibody. ALG-2, apoptosis-linked gene-2 product; GFP, green fluorescent protein; EGFR, epidermal growth factor receptor; si-NC, negative-control small interfering RNA; WT, wild type. Mouse anti ALIX antibody, clone 3A9 recognizes the apoptosis-linked gene-2 interacting protein X (ALIX), also known as Programmed cell death 6-interacting protein or Hp95. ALIX is a 868 amino acid ~90kDa cytoplasmic protein containing a single BRO1 domain implicated in endosomal targeting (Kim et al. 2005). ALIX was first reported to play a role in apoptosis dependent on its association with PDCD6 (Mahul-Mellier et al. 2006) but has subsequently shown to be involved in endocytosis (Matsuo et al. 2004), viral budding (Irie et al. 2008) and actin cytoskeletal assembly (Pan et al. 2006). Mouse anti Alix, clone 3A9 has been used extensively for the detection of ALIX by Western blotting (Sun et al. 2016) and for the identification of an ALIX homologue in the sea urchin Paracentrotus lividus (Romancino et al. 2013). Spleen cells from immunized Balb/c mice were fused with cells of the SP2/0 murine myeloma. This product does not require protein digestion pre-treatment of paraffin sections. Pan, S. et al. (2006) Involvement of the conserved adaptor protein Alix in actin cytoskeleton assembly. J Biol Chem. 281 (45): 34640-50. Pan, S. et al. (2008) Extracellular Alix regulates integrin-mediated cell adhesions and extracellular matrix assembly. Dangaj, D. et al. (2011) Mannose Receptor (MR) Engagement by Mesothelin GPI Anchor Polarizes Tumor-Associated Macrophages and Is Blocked by Anti-MR Human Recombinant Antibody. Liu, W. et al. (2012) Galectin-3 regulates intracellular trafficking of EGFR through Alix and promotes keratinocyte migration. J Invest Dermatol. 132 (12): 2828-37. Zhou, X. et al. 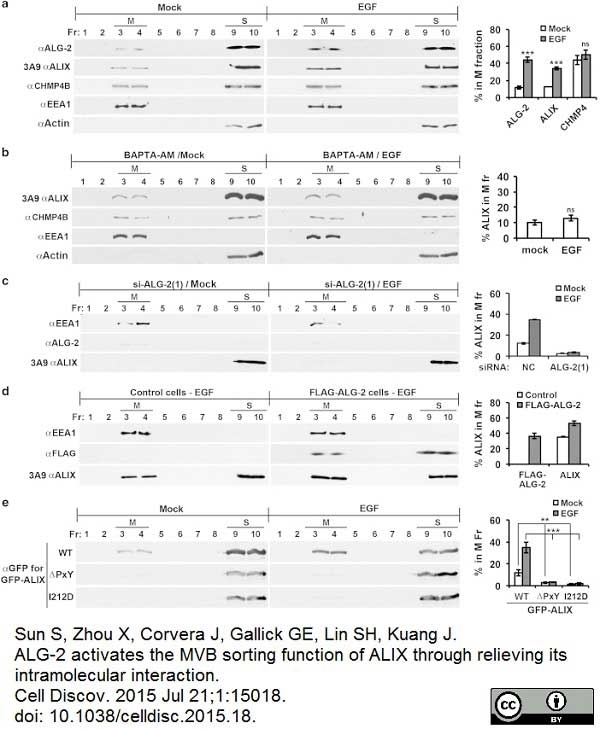 (2008) The HIV-1 p6/EIAV p9 docking site in Alix is autoinhibited as revealed by a conformation-sensitive anti-Alix monoclonal antibody. Pusic, A.D. & Kraig, R.P. (2014) Youth and environmental enrichment generate serum exosomes containing miR-219 that promote CNS myelination. Chen, H.Y. et al. (2009) Galectin-3 negatively regulates TCR-mediated CD4+ T-cell activation at the immunological synapse. Proc Natl Acad Sci U S A. 106 (34): 14496-501. Pusic AD et al. (2014) IFNγ-stimulated dendritic cell exosomes as a potential therapeutic for remyelination. J Neuroimmunol. 266 (1-2): 12-23. Pusic, A.D. & Kraig, R.P. (2015) Phasic Treatment with Interferon Gamma Stimulates Release of Exosomes that Protect Against Spreading Depression. J Interferon Cytokine Res. 35 (10): 795-807. Sun, S. et al. (2016) Phosphorylation-Dependent Activation of the ESCRT Function of ALIX in Cytokinetic Abscission and Retroviral Budding. Dev Cell. 36 (3): 331-43. Sun, S. et al. (2015) ALG-2 activates the MVB sorting function of ALIX through relieving its intramolecular interaction. Feng, Z. et al. (2007) Alternative polyadenylation produces two major transcripts of Alix. Arch Biochem Biophys. 465 (2): 328-35.